Imagine that the infamous Captain Nemo was not only real â€“ but a childhood friend of Jules Verne. Imagine also that the scientific romances that made the adult Verne a household name were actually the true adventures of Nemo as he grew from an idealistic youth to an embittered adult â€“ waging his war against war. 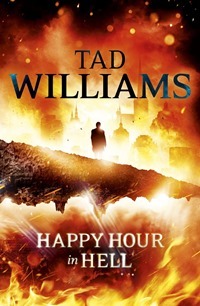 Thatâ€™s the basis of Andersonâ€™s old-fashioned adventure novel â€“ and a pretty good one it is, too. AndrÃ© Nemo is the son of a shipwright; Verneâ€™s fatherâ€™s a dull, unimaginative lawyer. Against the odds both boys are close friends, growing up together in the costal town of ÃŽle Feydeau. Nemo is the adventurer, the doer; Verne always fighting shy at the last moment: even then living vicariously through his friend. Their adventures are often shared by the beautiful Caroline Aronnax; both boys love her â€“ but Verne is never able to articulate his feelings. When AndrÃ©â€™s father is killed in a tragic accident, Carolineâ€™s father arranges for him to join a British scientific voyage (since thereâ€™s no future for him in ÃŽle Feydeau as a penniless orphan) â€“ and the adventure begins. Kept back from joining his friend, all the younger Verne can look forward to is a future as a lawyer with his father â€“ though he dreams of adventure and becoming a famous author and playwright. Caroline dreams of AndrÃ©. Nemoâ€™s ship is attacked by pirates and he alone survives, making his way to a mysterious island where he becomes a real Robinson Crusoe, utilising his innate engineering genius to make life palatable. You can see where itâ€™s all heading â€“ but thatâ€™s half the fun. Names that Verne will later use in his work are scattered throughout the book: Aronnax, Captain Grant, Ned Land, Arne Saknussemm, Phileas Fogg, Conseil, Cyrus Harding, to name just a few. And the various sections are given familiar titles: 20,000 Leagues, A Journey to the Centre, Robur the Conqueror, Master of the World, The Mysterious Island, etc. 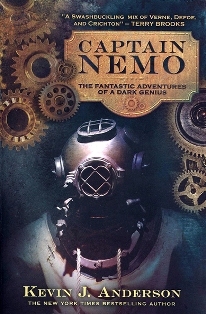 Nemo encounters dinosaurs, vast guns designed to send men to the moon, balloons of revolutionary design, and underwater boats; whilst throughout his journeys, he always gets word back to Verne who will one day, encouraged by Alexandre Dumas and a new publisher, turn the reports into his Extraordinary Voyages. Interestingly, although the book is inspired by literary works, itâ€™s pretty clear Andersonâ€™s own influences are the movies. From his description itâ€™s obvious that his Ned Land is Kirk Douglas from Disneyâ€™s 1954 adaptaion of 20,000 Leagues Under the Sea. Conseil is Peter Lorre from the same film, as is the spiky, steam-punk Nautilus. By the time Nemo is in his forties, heâ€™s turned into James Mason (complete with decorative white quiff). And Phileas Fogg is David Niven at his most stiff-upper lipped. Iâ€™m sure there are many Iâ€™ve missed. On the negative side, I spotted several basic typos â€“ and two real howlers. The noble Mohican from Fennimore Cooperâ€™s novels is Chingachgook, not Chinganook; whilst the French for gentlemen is â€˜messieursâ€™, not â€˜monsieursâ€™ â€“ basic schoolboy French. These really should have been picked up during editing. Overall though a great read: a deliberate ripping yarn. Even if Jules Verne comes across as a big of a prig: jealous, insecure â€“ often quite shallow â€“ the real hero is undoubtedly Nemo: dark, driven, unstoppable. As Verne often wonders throughout the book: What is it about the man?